Tony Klapper joined the A2L team after a vibrant and successful career as a litigator at law firms like Kirkland & Ellis and Reed Smith. One of the reasons that he has meshed so well with the culture here at A2L is his penchant for storytelling, particularly as it applies to persuading in the courtroom. In the past year, I've had the pleasure of watching Tony deliver private storytelling training sessions to litigators at many of the very top litigation law firms. And I have also had the distinct pleasure of watching him work with our customers, who are primarily large law firms engaged in litigation with hundreds of millions, or billions, of dollars at stake. Having been in this business and having seen a lot of people do this kind of work for three decades, I can say with confidence that Tony is absolutely superb at combining the development of a high-quality narrative with high-quality persuasive visuals. So it's with great pleasure that I announce an upcoming free public webinar on storytelling for litigators on Wednesday, January 11, 2017 at 1:30 pm (EST) - NOTE: Recorded version will be available after the event if you register. Everyone is invited to attend. All you have to do is sign up, and that takes about 30 seconds. Here's the link to register.So whether you're considering how best to tell a story in the courtroom for an upcoming case or just want to hear the latest techniques and science that relate to persuasive storytelling, you will want to attend this free one-hour session. 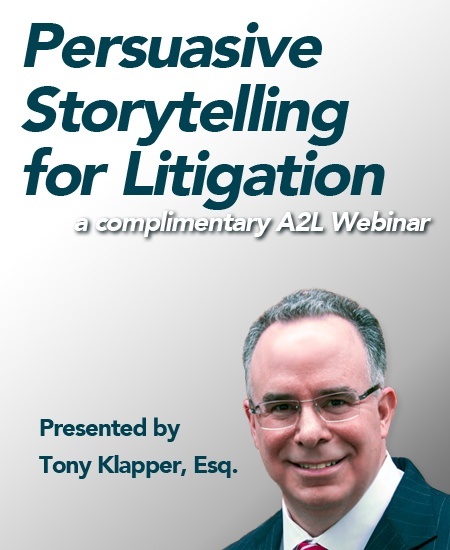 In this session Tony will be sharing techniques that he has learned in his more than 20 years of litigation – and techniques that we use at A2L to help trial teams and their experts maximize their persuasive ability in the courtroom.